This is one of my favourite cakes. From childhood I used to have occasional cravings for this cake and used to always buy this from a popular bakery in Trivandrum disregarding the price tag. As I grew up and learnt the basics of baking I always wanted to make this myself but never got the recipe that I really wanted. As you all know it gives you great joy in making something by yourself rather than buying from the store. Beat egg yolks well. Add half the amount of granulated sugar and vanilla extract and beat again. Continue until the mixture has well combined. This would take about 5 min. In another mixing bowl that is completely dry beat the egg whites until it becomes thick and fluffy and stands up when you lift the whisk/beater. Add the remaining amount of sugar and beat well until well combined. This would take about 5-6 min or even longer. Now add the egg whites into the yolk mixture and beat well until combined. Keep aside. Add cocoa powder, baking powder, soda powder, coffee powder and salt to cake flour. Sift this about 5 times so that all the ingredients gets mixed well. Add this to the egg mixture in small portions only beating the mixture each time after adding the flour mixture. Add the cake mixture to two buttered 9" baking tray( u can use any shape-square,round or heart shaped) lined with parchment paper. Bake at 350 F for about 25 min or until a knife/tooth pick inserted into the centre of the cake comes out clean. Depending on the oven the baking time varies. For me it took only 20 min. As the cake tin changes so does the baking time. Allow the cakes to cool well before unmoulding. Prepare syrup for wetting the cake by combining water and sugar on low-medium heat. When well combined take off from heat and add 3 tbsp wine. Allow this to cool. Prepare frosting by combining cream, sugar & 3tbsp wine in a mixing bowl and beat it well until it attains the desired thickness needed to frost. After both the cakes have cooled well take a cake layer and wet it with the sugar syrup. Spread jam on top and then spread the frosting. Place a few cherries on top of this frosted layer. Now place the other cake layer on top of the above and wet it with sugar syrup. Spread raspberry jam on top and then frost the cake on the top and sides. 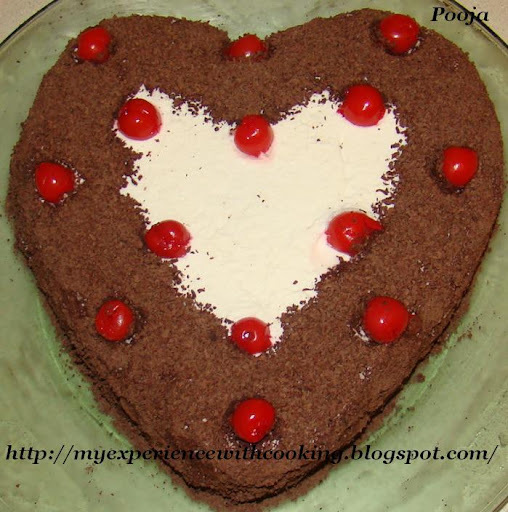 Cover the cake completely with grated chocolate and decorate with cherries. Keep the frosted cake in the refrigerator for some time before serving.